We do not sell reproduction or modern weapons. 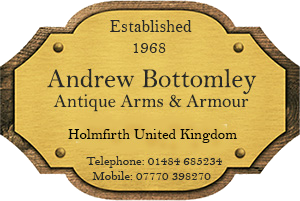 We have been established in the antique weapons business since 1968. Today we carry in stock the largest selection of genuine antique weapons for sale in Great Britain. This website shows a selection of antique weapons, every one is in stock now and all are for sale. Antique weapons similar to those shown are always wanted. Every item on our website is guaranteed to be original. We have many more antique weapons to add to this website, so please come back and visit again soon. Any item may be sent worldwide with the exception of items that contain ivory, these can not be exported. To use the search facility on our website please use the search box on the home page where you can enter any word to assist you in looking for certain items. A selection of our items available for sale can be viewed on the following web pages. Please remember that these items are original antiques and before placing an order you should expect there to be some degree of age showing. We are always interested to purchase good quality antique weapons and we travel worldwide searching for interesting items. If you should be thinking of selling a collection, or a single piece, please get in touch. We can pay top prices and guarantee to pay you more than you would get by selling through auction. Payment for any item that you wish to purchase from us may be made by either Credit card / debit card, or direct bank transfer. We do not accept Paypal. We have been in this business since 1968. Calling the UK from overseas +44 1484 685 234 9am-5pm UK time. Outside these hours you can leave a message or send an email anytime.